Till date, we have seen 15 different persons as chief ministers of Punjab, in a total of 23 terms. Since independence, the elections for the Punjab Vidhan Sabha are held for 15 times and the last elections were held in February 2017. Punjab has been under the President's rule for a record 8 times. A complete list of CM of Punjab is given in the following sections. The current chief minister of Punjab is Capt. Amarinder Singh, who belongs to Congress party and became CM of Punjab for second time. The last elections held in 2017 were for the 15th Legislative Assembly of Punjab (Punjab Vidhan Sabha). In these elections, Congress party got a clear majority by winning 77 seats from a total of 117 seats and Capt. Amarinder Singh became the chief minister of state. For a list of council of ministers in the current govt, check the page Punjab Ministers List. For complete political history of Punjab, take a look at the book Electoral Constituencies and Political Leaders of Punjab (ਪੰਜਾਬ ਦੇ ਚੋਣ ਹਲਕੇ ਅਤੇ ਰਾਜਸੀ ਆਗੂ). This book contains information about all the electoral constituencies in Punjab. 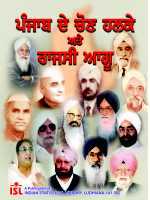 It also contains brief details about all the elected M.L.A.s, M.P.s of Punjab since independence. It also throws some light on the Political Families of Punjab. A complete list of all the chief ministers of Punjab is given here. Dr. Gopi Chand Bhargava - After the independence, he was the first chief minister of Punjab. He was born in 1889 in Sarsa district of undivided Punjab. He name of his father was Munshi Badri Prasad. He passed MBBS from Medical College, Lahore in 1912 and started medical profession in 1913. He became chief minister of Punjab on 15 August, 1947 and was in the chair till 13 April, 1949. Second time, he was the chief minister of the state from 18 October, 1949 to 20 June 1951. On 21 June, 1964 he became the chief minister for the third time and remained the chief minister till 6 July, 1964. He died on 26 December, 1966. Shri Bhim Sen Sachar - This freedom figher of Punjab was born on 1 December, 1893 in the house of Rai Sahib Nanak Chand Sachar at Peshawar (now in Pakistan). He was the chief minister of Punjab from 13 April, 1949 to 18 October, 1949. He was again elected as chief minister for second time on 17 April, 1952 and resigned from the post on 23 January, 1956. He also ramained the governor of Andhra Pradesh and Orissa. S. Parkash Singh Badal - S. Parkash Singh Badal became the chief minister of Punjab in 1970. He is a member of Shiromani Akali Dal. In 2012, he became the chief minister of the state for the record fifth time. Earlier he was inducted as the CM in 1970, 1977, 1997, 2007 and 2012. He also has the record of becoming MLA of the state for maximum number of times. In 2017 elections, he was elected as MLA for the 11th time and represents Lambi constituency in Sri Muktsar Sahib district. S. Parkash Singh Badal, chief patron of Shiromani Akali Dal, was choosen of Padma Vibhushan award in year 2015, by Narendra Modi led BJP government in the center. It is the second highest civilan award in India. He was honoured with this award for his life time contribution to the political scene in India. He was presented this award on 30 March, 2015 by the President of India Sh. Pranab Mukherjee. The citation presented to Badal termed him the "grand patriarch on the Indian political scene." Smt. Rajinder Kaur Bhattal - She was the chief minister for less than 3 months, from 21 November 1996 to 11 February 1997. Till date, she is the only female chief minister of Punjab. Capt. Amarinder Singh - Captain Amarinder Singh is the current chief minister of Punjab. He is a former amry man and served as a Captain in the Indian Army, that's why having the title 'Captain' with his name. He has also participated in the Indo-Pakistan war of 1965. It is his seond term as the chief minister and has earlier served as CM from 2002 to 2007. 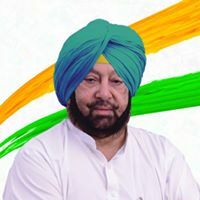 He belongs to the royal family of Maharaja Patiala and son of last king of princely state of Patiala, so sometimes referred as Maharaja Amarinder Singh. He is also an avid writer and has written various books, most notably The Last Sunset: Rise and Fall of Lahore Durbar. Answer: Dr. Gopi Chand Bhargava. He became the chief minister on 15 August, 1947 when India got independence. Answer : Bibi Rajinder Kaur Bhattal is the first and only women till date to become the chief minister of Punjab.